Equipment - ARD Industries Ltd.
Our facility includes nine (9) Friction Welders, CNC Lathes/Machining Centers, Multi-Station Lean Automation, conventional Turning, Milling, Drilling and post weld Induction Stress Relieving. We are currently cutting round bars, tubes, flat bar and extruded shapes with our two fully automatic bandsaws from Kasto and Hyd-Mech. All served by our fully equipped tool room and maintenance department. 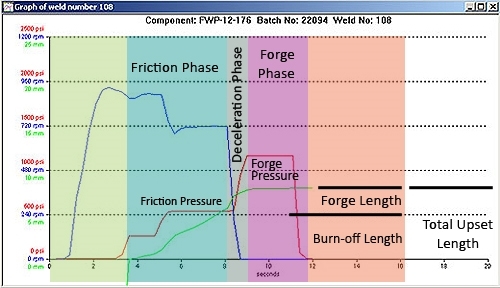 13" to Chuck Face x 3.00"
22" to Chuck Face x 4.75"
40" to Chuck Face x3.5"
22" to Chuck Face x7.00"
All our friction welders have been retrofitted to add the capability of recording full weld data throughout the weld cycle. This allows for data collection, setup, archiving, retrieval and plotting. All friction welders have an upgraded Allen Bradley PLC based microprocessor controller along with state of the art weld monitoring capability for weld process quality assurance. We have also installed new state of the art drives on over half our friction welders including some with orientation. 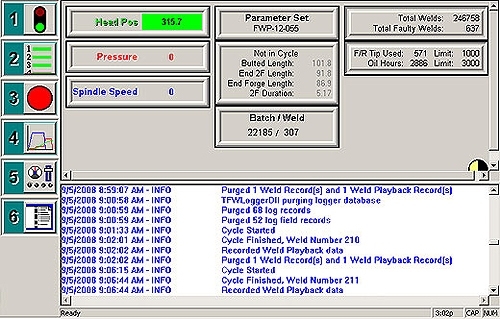 A.R.D.’s operator interface provides the HMI (Human Machine Interface) required to set-up and operate the friction welder. 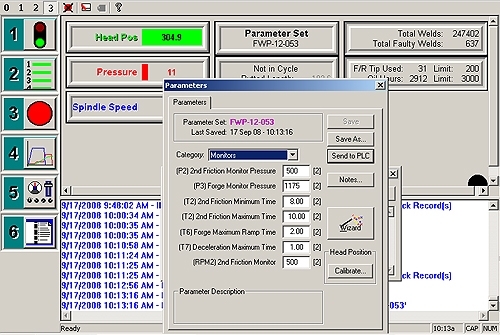 The operator interface uses a standard windows based computer with full colour LCD display, an internal hard disk and CD-Rom drives for data archive and retrieval. The internal hard disk makes it possible to store a very large number of weld parameter sets along with a large amount of historical weld playback data. All Friction welders are linked via network to the Quality Assurance Office.